I know it sounds totally crazy, but yesterday morning I had coal for breakfast. Now, don’t worry! I am not one of those naughty children to whom Santa brings nothing but a lump of coal. Plus, there is still just over a month left to Christmas, anyway! No, it was something much more sophisticated than that! You know how I told you a couple of years ago that here in Italy breakfast often consists of a coffee and brioche. Well, believe it or not, but local bakeries and patisseries now offer brioches made with vegetable coal! What is a brioche and why it is different from a croissant (apart from sharing a similar shape), I told you at length in this blog post. Please, give it some love by clicking on the link (thank you!). 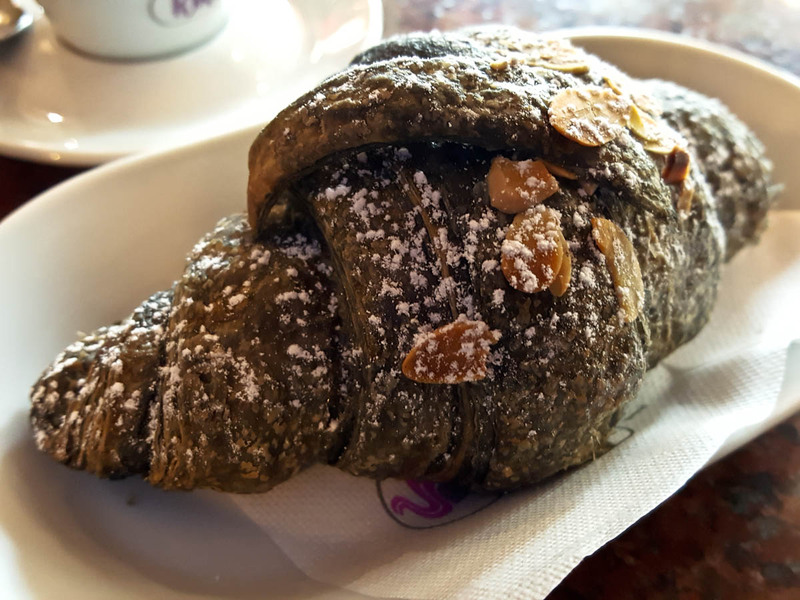 Also, kindly note that what is called a ‘brioche’ in the Northern Italian region of Veneto (where I currently live) is known as cornetto in other corners of Italy. OK, now that we got terminology out of the way, let’s get back to the main topic of discussion here. And why would you want to eat something made with it. You see, Italians apart from being famous for their food, are also well-known for being quite preoccupied with their digestive systems. Correct digestion and how to maintain it is on everybody’s mind. In general, people seem to be careful in terms of what they eat and how much of it they eat. And I once chatted to a lovely Italian lady who complained that the hand-kneaded and hand-stretched to a super thin crust pizza base offered by the local family-run pizza shop was simply too heavy for her. At telling me this, she clutched at her slim stomach and made a pained face. I didn’t have the heart to tell her that what passes for pizza in England is a much-thicker (often) pre-fabricated dough slathered with either a tomato or a barbecue (yes, I know) sauce and then piled up with toppings about inch or two high. So, anyway, coal and why Italians are using it in their baking. You know that terrible sensation when you feel like your clothes (especially around the tummy area) are suffocating you and you are like about to explode?! This is what eating too much sugar, fats and alcohol does to your digestive tract. It’s a terribly uncomfortable feeling and if can make you grumpy and difficult to be around. Well, vegetable coal – the product of carbonized coconut husks – is used to combat all that. It relieves bloating and flatulence by absorbing gases caused by bad eating habits, plus it helps reduce abdominal distension (you know, when your tummy feels like it’s extended to the max) and thus stimulates the slimming process. If you want to learn more about vegetable coal and its properties, click here – it is a very nice and concise article giving you further details (obviously, always consult your doctor before initiating any type of cure that you have read about on the internet!). So, OK, taking in consideration all of its health benefits, the Italians have found an ingenious way to use vegetable coal. They bake with it! 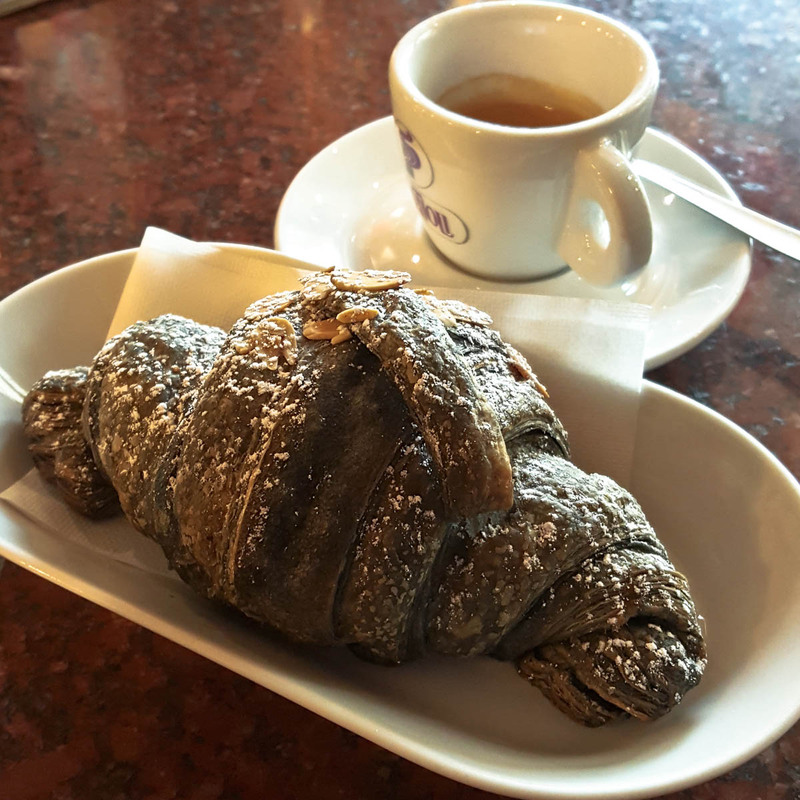 The brioche (or cornetto) with vegetable coal is gaining popularity across Italy and my local patisserie serves it for a quick and tasty snack all through the day. When you first see it on the shelves alongside the regular types of brioche, you can’t help it but find its appearance a bit unusual. Unlike the traditional brioche with its golden crust, the coal brioche is almost black. Bite into it and you will find for yourself that it tastes really good. As the vegetable coal is odorless and tasteless, it doesn’t per se affect the flavour of the dough. On the other hand, my local patisserie, for example, fills its coal brioches with almond paste, so they actually taste rather divine. Much nicer than the simple cream or chocolate brioche which you could buy anywhere. Couple one with a cup of proper Italian coffee and, presto, you got yourself a great little breakfast. It would be quite tempting to think that the addition of the vegetable coal to the brioche dough counterbalances the effects of the sugar added to it, too. Unfortunately, the experts claim this is not quite the case, as the quantity of vegetable coal in baked products is quite negligible for any real health benefits. In any case and every now and then it makes a nice change to have a coal brioche for breakfast. The colour is really striking and they taste really good. So, if you find yourself in an Italian bakery or a pattisserie staring at a display with unusual coal brioches in front of you, go on and pick one. It will be worth it even for the novelty factor alone! P.S. 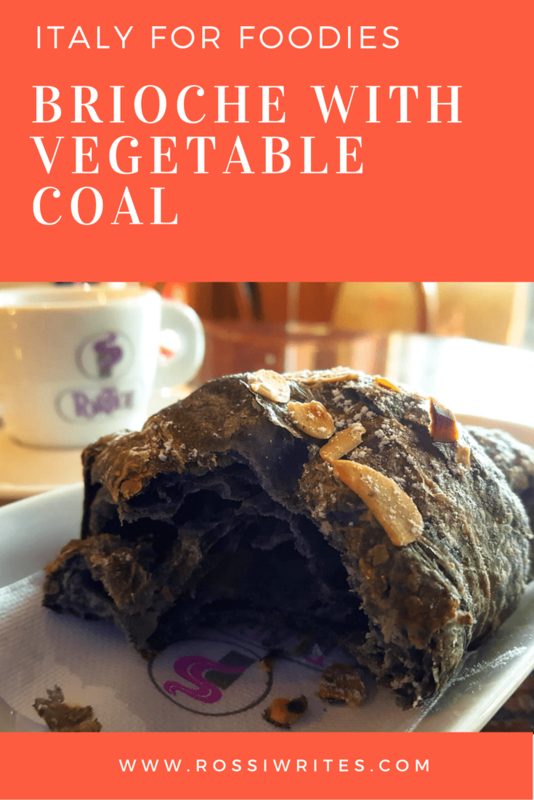 I have been told that vegetable coal is now also used to make bread and pizza in Italy. I am as of yet to come across any of them myself, but I am keeping my eyes open. Have you had a brioche, bread or pizza made with vegetable coal? What is the most unusual food you have ever tried in your life? In Italy or elsewhere? Share with me your thoughts and impressions in the ‘Comments’ section below. I would love to read them and engage with you. 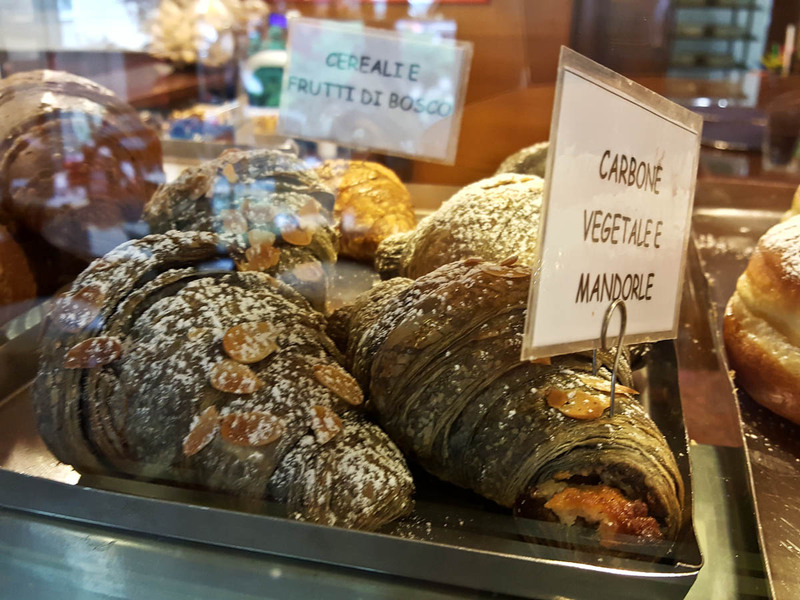 Click here to read more articles from my blog series ‘Italy for Foodies’ to find out why you shouldn’t stop just at pizza and pasta in the bel’ paese. My goodness, Lord of Everything Sweet and Scrumptious, this brioche is so going to my “must-eat” list. If I go to the southern part of Italy, I should ask for cornetto, right? I cannot wait to wrap my lips around this delicacy!